Brother Alois and other brothers of Taizé were in Vienna, Austria, in March 2011 for an evening prayer and a youth meeting, as part of the pilgrimage of trust. The links between the Taizé Community and the people of Vienna go back a long way. Well before the European meetings in 1992 and 1997, there were regular prayers in the city. Brother Roger himself went on various occasions. At that time it was scarcely possible to come to the Austrian capital from the neighbouring countries. Most thankfully everything is more simple today. Brother Alois and another brother went to Vienna for a stage of the pilgrimage of trust. And what a joy it was to see young people from the neighbouring countries arriving for the meeting! On Friday evening, the church was “bursting at the seams” and the prayer around the cross went on till very late. The people of Japan were particularly remembered in the prayers. The young people who came from far way were warmly welcomed by host families. A mid day prayer, and the noon meal, theme workshops in the churches of the deanery, brought the day to a close. It was encouraging to see the young people set off to transmit a hope in their turn. At the same time, a symposium was taking place during which Brother Alois spoke on the theme of trust. The participants reflected on the question, “How can we live in a Christian way today?” During these two days it was palpable that the desire for hope and trust brought together each human being, beyond frontiers and the barriers between generations. Two young women who are staying for a longer time at Taizé went to visit Vienna, in February. They wrote the following account. In February, we visited Vienna – the Austrian capital. The main reason for our visit was to help with the preparation of the meeting held in March, animated by Brother Alois and another brother of Taizé, and to which the young people from Austria and some surrounding countries were invited, to pray, share, and discover their faith together. Before leaving, we thought that our main task would be to invite people to the meeting, to talk about Taizé, about faith, to listen to the young people. We visited schools, parishes, and various communities. The situation of the Church in Austria is not simple at the moment and the young people in particular are discouraged and don’t know what to do, or what direction to take. They want to feel that their presence is important to the Church. In inviting young people, the brothers of Taizé wanted to help them discover that: Jesus welcomes each one of us. No matter what your origins, no matter what you do, He loves you. 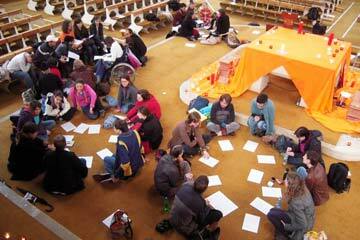 Most of the young people we met knew nothing about Taizé; some had heard the name, but didn’t know what it was. Their astonishment at seeing that the brothers of Taizé – who they had never met, and who didn’t know them – were interested in them and wished them to be full of hope and trust in themselves, in God, and in other, was probably the most important thing in our stay. This was equally a stage in the pilgrimage of trust for us. Everyone we met was full of kindness, joy and trust. We were very touched by the openness of their hearts. During one of our meetings with young people, someone asked the question: “Is Christianity madness?” For us, far from being madness, it is a blessing. We hope that the meeting allowed them to discover that they are not alone. We are building a community, the community of Christians.